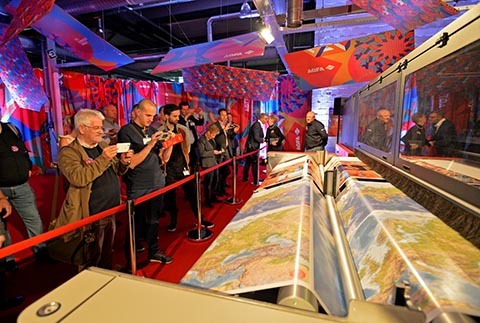 Over the course of two days, more than 300 print service providers, influencers and trade press members are attending Agfa Graphics’ exclusive Red Carpet Event for a first look at the Jeti Tauro H3300 LED and its extreme capabilities. Attendees of the Red Carpet Event are offered an unforgettable experience: the public debut of the Jeti Tauro H3300 LED. Additionally, guests can see Agfa Graphics' complete offering of integrated end-to-end wide-format inkjet solutions at work in the demo centers, consisting of robust and reliable printers, vibrant UV inks, dedicated workflow software, and finishing solutions. All of these elements are designed in accordance with Agfa Graphics' ‘matched components approach’ and adhere to the highest quality standards while offering extreme productivity. Experts share the latest in research developments and application knowhow, and there are plenty of opportunities to exchange experiences and knowledge with peers. At FESPA 2018, Agfa Graphics drew a lot of attention with its new EXTREME campaign, with the slogan ‘Extreme productivity. Extreme quality.’ Achieving the perfect balance between quality and productivity, Agfa Graphics’ inkjet printing solutions are designed to respond quickly to high-volume demands without compromising on quality. In fact, Agfa Graphics combines photorealistic print quality, versatility and high productivity at a best-in-industry price point. Building on the successes of the Jeti Tauro H2500 LED, Agfa Graphics launched the (even) bigger, sturdier and faster Jeti Tauro H3300 LED – an engine which guarantees both smooth, detailed results and rapid UV-LED curing. This hybrid UV inkjet workhorse produces visually stunning prints on media up to 3.3 m wide at speeds up to 453 m2/h, keeps going 24/7 and is convertible to enable different degrees of automation. In addition, it excels at combining award-winning image quality with low ink consumption. This Red Carpet Event shows the Jeti Tauro H3300 in action for the first time.